It’s very tempting in this cold windy weather to just throw on a tracksuit, and that’s perfect if you’re lazing around the house for the day. But if you’re heading out and about it doesn’t take much effort to sass it up a bit and still be warm and comfortable. I guarantee you’ll feel better about yourself if you put some thought into it. 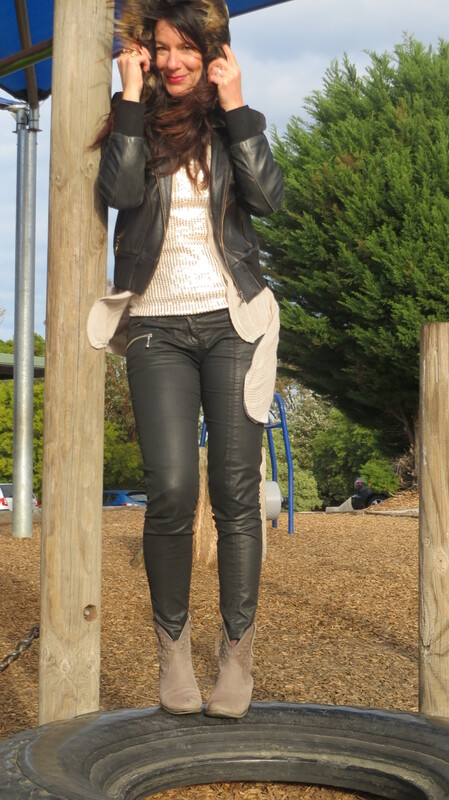 I started off with my fave Sass & Bide jeans today, then layered up with a sequinned singlet over a long-sleeved top, a long tapered knit, leather jacket and booties. I took my little guy to an indoor play centre to hang out with a group of his prep buddies while my extravagant brother treated my big boy to a gold class movie experience! It was the perfect indoor day given the wind was so wild it nearly blew my tripod over numerous times. 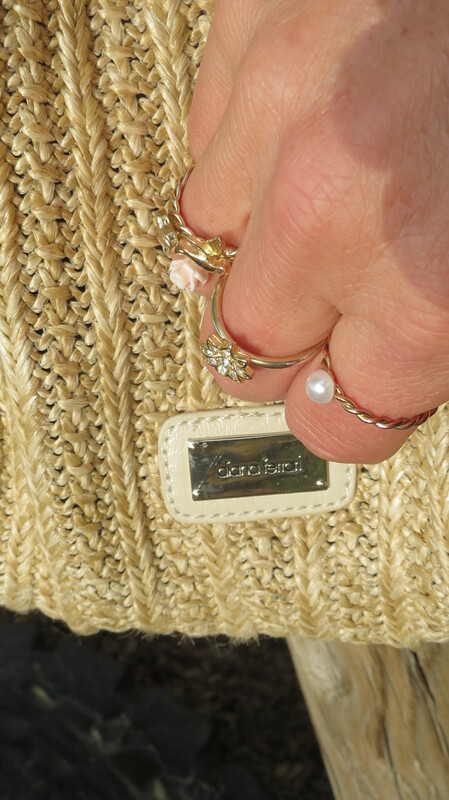 Fine jewellery is very much in vogue including rings like these. Try one or two on your fingers or layer up. 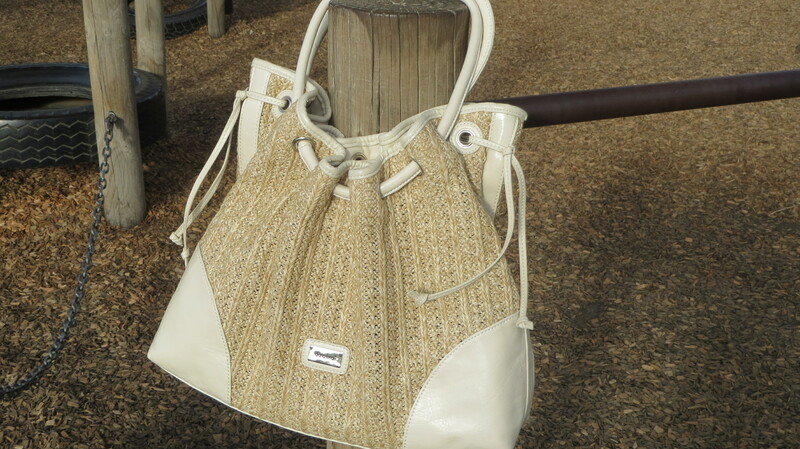 This raffia Diana Ferrari tote is sure to become my go-to handbag for summer. “Therefore, behold, I will allure her, will bring her into the wilderness, and speak comfort to her. I will give her her vineyards from there, and the Valley of Achor (trouble) as a door of hope; she shall sing there, as in the days of her youth, as in the day when she came up from the land of Egypt.” Hosea 2:14-15. You look wonderful… most of my times is spent in p.j’s or ill-well, they fit,but r too long for my short self! jeans and t-shirt. I REALLY DON’T “DRESS-UP” UNLESS HUBBY IS TAKING ME OUT FOR SOMETHING SPECIAL! Amanda I’m shocked! You don’t know what you’re missing out on girl. Playing dress-ups can be such fun. playing dress-up is not in our budget! sorry, but I don’t mind seeing people have fun with it! Oh, I love those boots so much! Thanks Katy! I hope you find something like them if you’re hunting around. Actually now is a great time to go boot shopping; there’s some huge sales on.